A new analytical framework revealed the probability of regional floods relative to reservoir regulation. 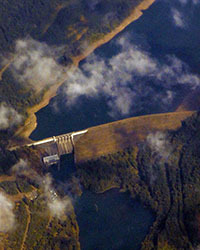 Lookout Point Dam in Oregon is seen overhead in this photo. Reservoir operations may challenge the basic assumption of stationarity used in flood frequency analysis. Photo by Rehman Abubakr / CC BY-SA 4.0. Flood frequency curve (FFC)—a mathematical expression of the probability distribution of floods—is an important tool for estimating flood risk, with a conventional assumption of stationary flood series data. However, environmental changes in the past decades are changing that assumption. A research team including scientists at the U.S. Department of Energy's Pacific Northwest National Laboratory developed a new analytical framework to quantify effects of reservoirs that alter FFC characteristics. The framework revealed how reservoir regulation affects the shape of the FFC probability curve. Flooding causes significant socioeconomic and ecological damage. Analyses of streamflow records in the United States combined with reservoir modeling revealed an important influence of reservoir regulation on flood frequency. This study suggests the need to separately analyze pre- and post-dam flood records, each satisfying the stationary assumption for more robust flood frequency analysis. Such data could help guide regional-scale planning of hydraulic structures in complex river systems. The flood frequency curve provides a comprehensive description of a catchment's storm response. Previous studies mainly focused on how climate and urbanization affect flood frequency. However, reservoir operations may also alter FFC characteristics and challenge the basic assumption of stationarity (i.e., time series with statistical properties that are constant over time) used in flood frequency analysis. In this study, scientists used a dimensionless Reservoir Impact Index (RII)—defined as the total upstream reservoir storage capacity normalized by the annual streamflow volume—to quantify reservoir regulation effects. The team performed analyses using flood records for 388 river stations in the contiguous United States for pre- and post-dam periods. Researchers analyzed two statistical moments of the FFC: the maximum annual flood and the coefficient of variations, corresponding to the extreme and variability of streamflow. Results showed that the maximum annual flood generally decreased with increasing RII but stabilized when RII exceeded a threshold value. Meanwhile, the coefficient of variations increased with RII until a threshold value beyond which the coefficient of variations decreased with RII. Three reservoir models with different levels of complexity captured the nonlinear relationships of the maximum annual flood and coefficient of variations with RII. The models provided insights to understand impacts of reservoirs from their basic flood control function. Although all three reservoir models can capture the dependence of the FFC on RII, the threshold RII values in the nonlinear relationships can only be captured by the more complex reservoir models. The analytical framework developed in this study may be used to further improve flood risk assessment and management in regulated river systems at the regional scale. Sponsors: The U.S. Department of Energy Office of Science, Biological and Environmental Research supported H.-Y. Li and L.R. Leung as part of the Integrated Assessment Research and Regional and Global Climate Modeling programs. The National Basic Research Program and National Natural Science Foundation of China supported Wei Wang and Hui Lu. The Austrian Science Fund (FWF) and the European Research Council supported Günter Blöschl.